The Johnson's Antibacterial Powder for Cats an Dogs has proven effective in treating minor wounds such as scratches, bites, scrapes and cuts. This gentle powder soothes your pet’s skin whilst the antibacterial properties of the powder help to kill bacteria, aiding in the prevention of infection and supporting the natural healing process. This product is easy to use, simply add the powder to the dressing. 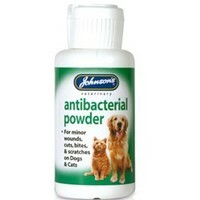 Johnsons Antibacterial Powder is suitable for both Cats and Dogs. One of my dogs suffers from dust/storage mite allergies, and whilst we are managing his condition with the help of our vet, being able to make him more comfortable when he has a flare up, without going to the vet, is very convenient. This product is ideal as it it has a little spout to dispense the powder, it keeps my dog's underarms dry (which is where he gets weeping sores if left to flare up and scratch himself). This powder has allowed us to manage his condition better and the sores he was previously not recovering from (requiring steroid treatment) we can now manage to keep dry, free from infection, less itchy, and the last flare up even healed with daily application of this powder. It's also good for minor cuts/grazes (he does love playing rough with his buddy) especially after bathing. My only qualm is that I wish there were a bigger size! I'll have to buy 10 of these to keep me in stock!